Alan Wake is officially coming back to Xbox in an all-new adventure, and Germany's ratings board just revealed the game ahead of its planned announcement this weekend. You've got to love game ratings boards sometimes. They're often more reliable about letting the general public know about future games than publishers are. Case in point: Germany's ratings group just revealed the existence of Alan Wake's American Nightmare, which is supposed to be officially unveiled this weekend at the Spike Video Game Awards. Now, a standalone Alan Wake game for Xbox Live is something that Microsoft's been teasing for a while. However, Germany's Unterhaltungssoftware Selbstkontrolle (USK) ratings board just listed the game with a "16" rating (meaning that the title will be restricted for gamers under the age of 16). According to Wikipedia, "Games featuring frequent one-on-one gunfights and moderate violence (no visible blood) will receive this rating. The game may cover adult themes." 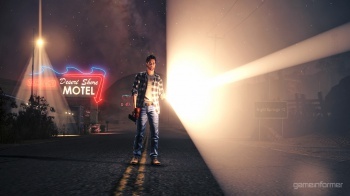 Earlier rumors stated that an Alan Wake XBLA game would be called Alan Wake: Night Springs. What will be interesting to see is if American Nightmare is the new name for the same project, or if it's another game entirely. I guess we'll find out this weekend when the VGAs air.